ST. LOUIS -- When Jake Allen was a teenager, he had quite the dilemma on his hands. Allen was faced with the prospect of sticking with hockey or trying to become the next great golfing sensation. As it turned out, becoming the next Tiger Woods only was a dream, apparently. "I wish," Allen told NHL.com. "I love golf. I absolutely love it, but you finally have to pick one sport and go with it. I think I finally realized when I was like 15, I sort of stuck with hockey and it's worked out." Worked out may be understating it a bit for the Fredericton, New Brunswick native, who not only has stabilized the St. Louis Blues' goaltending situation, but has become somewhat of a sensation in the Gateway City. And to think Allen nearly gave up a shot at seeing where his hockey life would take him after initially not being selected in the Quebec Major Junior Hockey League draft. "I was pretty small. I never really grew," Allen said. "I was late, so once I got drafted (by the St. John's Fog Devils), I sort of went there. I think if I didn't make that team that year, it would have changed my whole outcome on a hockey career." From the time Allen made his first National Hockey League start Feb. 13 in Detroit, all he's done is put up an 8-1-0 record with a 2.18 goals-against average and .920 save percentage. 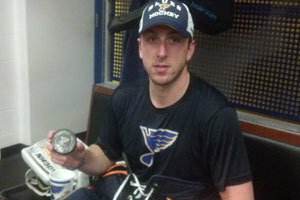 Jake Allen poses with a puck from his first career shutout after the March 7 game vs. Phoenix. It's become quite the unexpected story for a Blues team that brought back a pair of netminders in Jaroslav Halak and Brian Elliott, who last season shared the William M. Jennings Trophy. "It's sort of a whirlwind the last month or so," Allen said. "I'm still taking it in stride. I'm really pleased with the way I've played. I couldn't have asked for a better start, but I try to stay even-keeled, stay ready for the next game. Just take things one day at a time. "Once the season is over, I can sit back and reflect and think of the good things and some of the bad things that happened throughout the year. Right now, I'm just trying to stick with it. Whatever they need me to do, I'm going to do." With the way Halak and Elliott were stopping pucks for the Blues last season en route to a 109-point season and Central Division title, it was difficult to imagine the dynamics changing heading into 2013. But when the new season finally started, although the Blues got off to a solid 6-1-0 start, something was missing between the pipes. Halak's numbers haven't been poor [5-3-1, 2.38 GAA, .881 save percentage], but they haven't typical, and a groin injury sustained in Detroit on Feb. 1 derailed him for three weeks. Elliott, on the other hand, won three of his first four starts, then struggled. Enter Allen, the Blues' 2008 second-round pick. When coach Ken Hitchcock threw him into the fire at Joe Louis Arena, saying he had never done anything like that before, Allen overcame a sluggish start to help the Blues snap a five-game winless drought (0-4-1). His parents, Susan and Kurt -- his father is the athletic director and hockey coach at Leo Hayes High School in Fredericton -- bought the NHL Center Ice package just in time so they could watch their son from the town of roughly 60,000 Montreal- and Boston-clad fans, as Allen claims. "They don't miss too many games," Allen said of his parents. "They didn't get to watch me a whole lot [in the minors], but [now] they do when they can." Allen played four games during his initial call-up from the Rivermen, and after suffering his only loss, a 2-1 home defeat against the San Jose Sharks, the Blues sent him back to the AHL when Halak was healthy enough to play the following night at the Colorado Avalanche. However, when the Blues blew a 4-1 lead en route to a 6-4 defeat at the Los Angeles Kings on March 5, Blues general manager Doug Armstrong felt strongly that Allen needed to be back with the team. He wasted little time and made the announcement an hour after the game. "When you referred back to the way Jake played in those three road games [in Detroit, Calgary and Vancouver], it seemed like the proper thing to do to try and spark the team," Armstrong told NHL.com. "This was a lot deeper than just the goaltending situation, but we had to do something to try and grab everyone's attention." Allen was with the Rivermen at Lake Erie, got on a plane to Phoenix the next day and has been in goal for five of the last six games. Included are the last two wins, a 3-0 shutout of the Phoenix Coyotes on Thursday -- his first NHL shutout -- and a 2-1 overtime defeat of the Anaheim Ducks on Saturday. "He just plays," Hitchcock said of Allen, describing him as an old-school goalie. "He doesn't get into much discussion about anything other than, 'Am I playing? Am I not playing?' He has a real focus that he doesn't allow adversity to bother him. He's got a mechanism in place that he can distribute adversity in a different direction. That's the old-school guys. You used to see them skate around all the time to get rid of the anxiety or the anxiousness. He's found a way to do that in a good way that I think helps calm him down in critical situations." Allen is next in a line of recent Blues netminders that have opened eyes. Along with trading for Halak and signing Elliott as a free agent, the team has developed Allen, Ben Bishop and now draft picks Jordan Binnington and Niklas Lundstrom through the system. Allen's stock and a fear of losing Bishop through free agency forced Armstrong to deal Bishop to Ottawa for a 2013 second-round pick. Allen and Bishop have remained close friends. "Ben was going to be an unrestricted free agent because of the way Elliott had played," Armstrong said regarding Bishop's contract situation. "We were excited that we had Jake coming, but the parts were more based on Elliott and Jaro were playing so well, and Ben wasn't going to get enough games to stay as a restricted free agent. "Right now we're in a good spot, but we have to ultimately play well in front of them." Allen's numbers with the Rivermen -- 51-58-7 with a 2.76 GAA and .915 save percentage -- wouldn't appear to warrant a call-up by the parent club. But once given a chance, Allen, who credits David Alexander, the goaltending coach at the University of Maine, for his development, said he was going to make the most of it. "It's just taken a lot of doubts away from myself and a lot of other people," Allen said. "You're always a prospect and you're in the minors for a couple years -- three years [in his case] -- and people never know what you can really do unless you get a chance. "I told myself I worked extremely hard last summer and I said if I ever got an opportunity, I wasn't going to let it slide. This is what everyone wants to do when you come up through the minors. You want a chance, and you want to take it and run with it. That's what I'm trying to do right now."